We are distributors for many major pump manufacturers including Grundfos, Hayward Tyler, Lowara and Caprari, which are industry leaders in waterwell borehole submersible pumps. 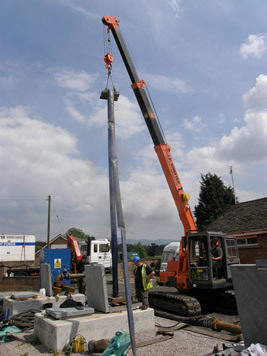 Varying sizes of specialist pump removal cranes specifically adapted for accessing restricted borehole locations. 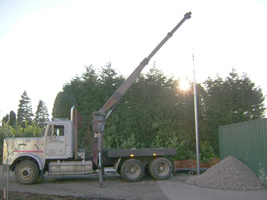 Mobile cranes up to 25tonne capacity. Smaller lifting apparatus including electric, manual and air chain blocks with varying capacity shear legs. All our systems are designed to prevent oversizing of pumping equipment. We monitor all aspects of a project from feasibility to the analysis of test pumping data to ensure the most economical solution for our clients. 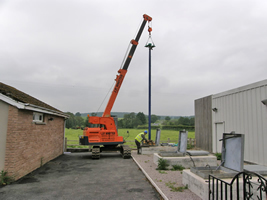 We can offer a full turnkey package on permanent pump installations including pump sizing, M&E design, contol panel construction, installation and commissioning. We also offer a 24 hour breakdown service on water supply borehole pumps. We probably stock the UK’s largest range of submersible borehole pumps and pump starters. 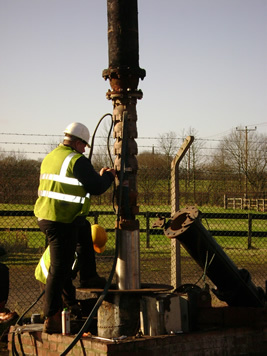 We provide pump repair and testing facilities for submersible pumps units up to 300kw. For professional help and advice please call our office to speak to one of our engineers. The pictures on this page show the removal and installation of pumps using different types of equipment. The rising mains shown include – screwed and socketted, flanged and the flexible Wellmaster system.